Renovation work on Plaster Hall’s Cornell Auditorium is nearing completion. The work – which includes new seating, lighting and sound systems – is so extensive that it “will hold very little resemblance to the old auditorium,” says Bob Harrington, Missouri Southern’s construction/risk manager. Work got underway the Monday following commencement, and crews have made quick work of the auditorium’s face-lift. The major demolition and installation work is complete. 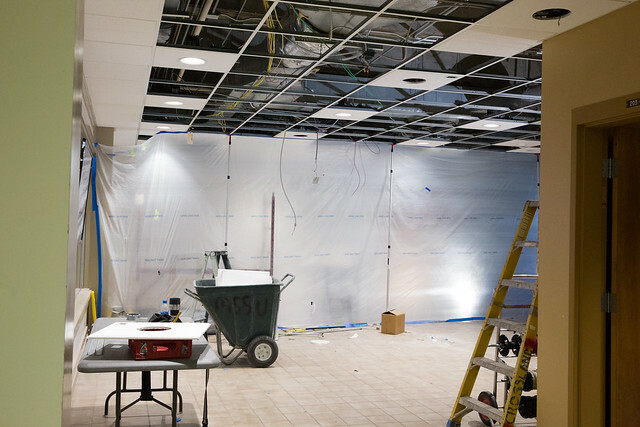 All that remains on the to-do list is installation of the new seating, building soffit in the entrance and lobby and finishing the electrical connections for new sound and audio-visual systems. The finished auditorium will extend into the lobby to create a space for hosting special events, and will boast new flooring, sound treatments and upgraded technology. Aesthetic changes include brighter colors, painted brick, and an all-around brighter and more pleasing environment. Work is slated to be complete in time for the start of the fall semester.